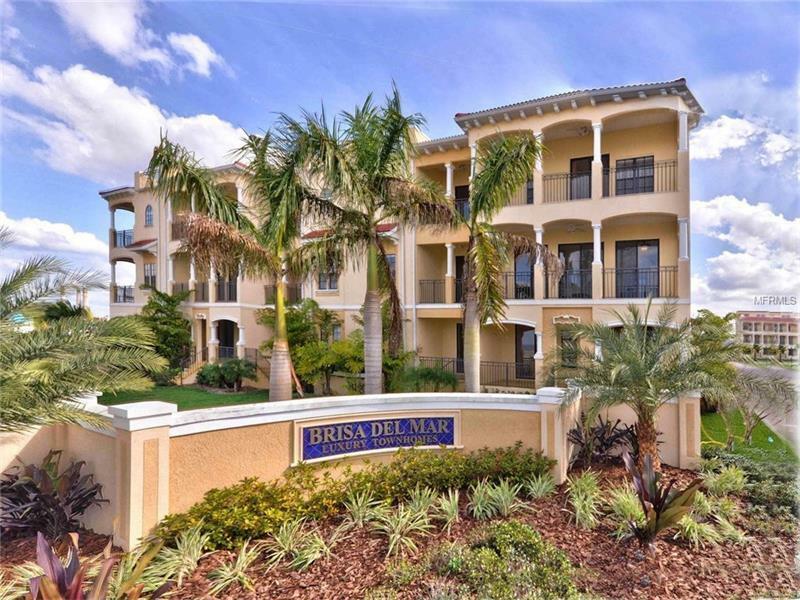 Located in Brisa Del Mar Mediterranean style townhome community at the end of Apollo Beach Boulevard this three floor townhome includes a private elevator and 3222 square feet of living space. On the first level you will find a spacious bonus room half bath and den (which could be used as a bedroom.) The main living area (covered in hardwood) is on the second level and includes a large great room dining room breakfast nook and two bedrooms. The third level features two extra large master suites each with full baths and large walk in closets. (The laundry room is on the third floor). All three living levels have their own balconies. The open rooftop garden is a great spot to entertain and enjoy the views of beautiful Tampa Bay. The townhome has 10’ ceilings and 8’ doors and it is trimmed throughout with crown moulding and 5'’ baseboards. It’s located close to restaurants Land’s End Marina and the newly restored Apollo Beach Nature Preserve. All buildings to be repainted in 2016 and the assessment is already paid!